Asia Pearl Travels & Tours Company Limited is a family-owned and operated independent non-government Myanmar Travel Agency located in Yangon. As with all other Myanmar Travel Agencies, we are officially registered with Ministry of Hotels & Tourism and authorized to operate tours in Myanmar. The Agency is making full use of the talents of family and relatives at home and abroad, and take leverage from the extensive network of business partners, friends, and contacts in Hotels & Travel Industry in Myanmar to provide excellent service to visitors from around the world. We offer Customized Tours tailor-made to the request of the clients. We have Tour Packages for sightseeing trips to popular tourist destinations of Bagan, Inle & Indein, Pindaya, Kyaikhtiyo, Mandalay, Mingun, Ava and Sagaing, Amarapura, Mount Popa, Pyin Oo Lwin (May Myo), Bago, Yangon, ancient city of Mrauk U, Mawlamyaing, Hpa-an & Mount Zwekabin. We also have Trekking trips to Kalaw and we can arrange for trekking in Chin Hills and the Himalayan ranges around Putao. We make Myanmar hotel reservations with good agent rates. We arrange for transport, including Ayeyarwaddy River Cruise from Mandalay to Bagan, domestic flights with e-tickets, and provide guide services. Our strength lies in combined talents, experience, and dedication of the people across different geographical regions who have several years of international experiences in travel & tour, ticketing, business administration, strategic planning, logistics, quality systems, and Industrial Engineering background. U Kyaw Soe Oo is a familiar face in Myanmar recognized by millions of Myanmar people nationwide, as he is formerly a News Announcer with Myanmar Radio and Television (MRTV). He is also sought after to perform as a Master of Ceremonies. In the Internet Age when global Service companies are increasingly delivering their products and services through the Internet, we are shifting away from the traditional brick and mortar isolated office space in the localized area to the global presence on the Internet. Our network of team members and stakeholders contribute towards the common goal from different locations around the world, and from within Myanmar. We cut cost on expensive office spaces except for a small home office in Yangon where we can meet customers if needed. By minimizing overhead expenses, we can pass on savings to our customers with lower markup or proft percentage. In most cass, we issue e-tickets or make arrangements without the need for the customers to visit our office. We have started to see a new era in Myanmar where Burmese people put aside differences in views and opinions and coming together to work towards tolerance and co-operation for the good of the country. And, the international community reacts positively to the latest developments in Myanmar. Travel websites such as The Lonely Planet now has more favorable view of Myanmar, and gave #2 ranking in The Lonely Planet's Best in Travel 2012. Myanmar has also received several other endorsements such as from CNN, and www.virualtourist.com has chosen Myanmar as one of the top 10 Places off the beaten path for 2013. We have a beautiful road ahead of us where we will put Myanmar on the map of popular tourist destinations in the World. We are among the first pioneers to offer Myanmar domestic flight booking Online, and despite competitions from big businesses with hugh advertising budget, we remain among the top 10 agents selling local airline e-tickets on Google, Yahoo!, and Bing. We also promote Myanmar culture and Burmese Language. We are the only Myanmar Travel Agency that offers Myanmar Language Lessons and appear in the top 10 on Google, Yahoo!, and Bing on several search terms relating to Myanmar Language. 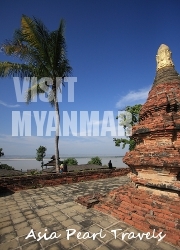 To help people experience smooth sailing and memorable Myanmar visit. As an ordinary stone magically turned into a beautiful Pearl with the loving tender care of the oyster, we will deliver our services with a personal touch to turn unremarkable tours into Memorable Moments in Myanmar. Our products and services will be like a Pearl of Asia-- as beautiful as the trip itself. We believe in honesty, integrity, fairness, and professionalism in all our business dealings. We take pride in our work and strive for continuous improvements in order to achieve excellence, timeliness, responsiveness, accessibility, and commitment in our services.